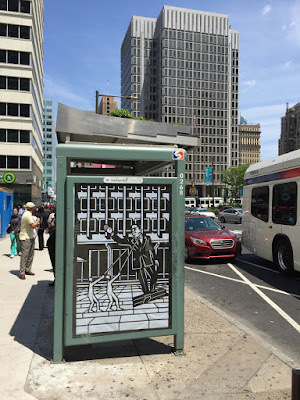 Joe Boruchow is one of a few Philadelphia based artist that have been doing some amazing work in the Philly bus shelter system. This new piece blew me away not only for its beauty but also for its politics and placement. Indicting Frank Rizzo for his unsavory past, Joe uses the bus shelter infrastructure to place his political criticism within the vicinity of a statue of Mr. Rizzo giving it a different value than graffiti or some other form of visual protest. This is top notch use of the PublicAccess keys and I can't wait to see more out of Joe, and the rest of you for that matter people! Let’s demote this “crumb bum” and remove his statue from the steps of Philadelphia’s Municipal Services Building. Frank Rizzo’s legacy of racial divisiveness and thuggery is no longer one that Philly should endorse. Like an effigy of an authoritarian dictator, the statue looms over our provincial politics and is a symbol of our dysfunction. Move him somewhere less prominent and let’s reserve our high profile public spaces for memorials of figures that all Philadelphians can be proud of.